I first heard about this book a very long time ago. I’m talking the beginning of 2011 when it was announced in Publisher’s Weekly and I made a mental note to look for it in the future as I was dying to read it. 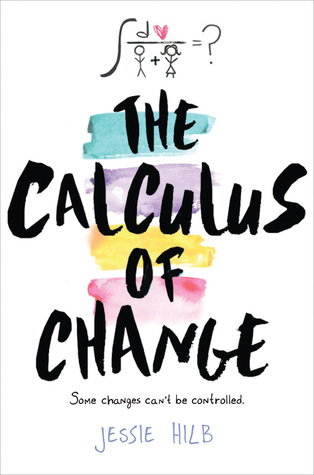 I was delighted when more details were finally released about the book, including the cover. I should say at this point that both UK and US covers are beautiful but I prefer the US cover (left) which is more of an accurate image to the book. 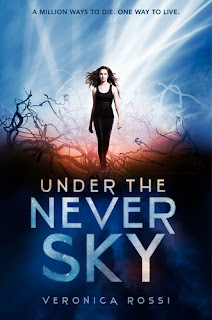 Under the Never Sky is an impressive debut novel set in a dystopian world that I read in ONE SITTING. Yes, I couldn’t put it down and I enjoyed it immensely. Under the Never Sky reminds me a little of Crossed by Ally Condie as it shares the same sort of harsh landscape and desperate fight for survival. The world building was fantastic, very easy to visualize and the idea of the Smart eye was fascinating. This is a little device that the wearer fastens over one of their eyes so that they can fraction themselves and effectively co-exist in a virtual reality. A form of escape for those lucky enough to have one. I have to say that I had no difficulty getting into this book and was immediately transported to Reverie in the first few pages. I loved how Aria and Perry were first introduced and how their relationship developed slowly over the course of the book in a very natural way. Society has conditioned them to be enemies and so they had a hard time warming up to each other at first but they needed each other to survive. I’m glad to say that there was no instalove here and whilst it was what I like to call a “slow burn” it wasn’t agonizingly slow; Veronica got the balance just right. Aria is a dweller who comes from inside the protection of the domes. Cast into the outside world, this girl has not got a clue how to survive on her own but we see a subtle shift in her towards the end of the book as she learns from Perry and adapts to her harsh surroundings. She develops from someone who is naive and helpless to someone who is strong and fights for survival, just like Perry. With regards to secondary characters, I have to give a shout out for Roar who I adored! He had a witty sense of humor which contrasted nicely against the seriousness of Perry and I would really love to see a conclusion with the plot surrounding him and Liv (Perry’s sister). Running through everything is the aether and the deadly threat it presents. What is the aether I hear you ask? Imagine yourself in the worst lightning storm ever. And then multiply it by 100. That’s the aether. Favourite scenes for me were when Perry first kisses Aria *swoon* and the final scene. Also, the idea of rendering? *more swooning*. What I loved about the ending was the fact that there was no cliffhanger. It could easily be a standalone book but you know there is more to the plot which we will see in the next book. I think you’ve probably gathered by now that I really enjoyed the book and I can’t wait to read more. The sequel entitled Through the Ever Night will be released in 2013 and the movie rights for Under the Never Sky have been optioned by Warner Brothers so we might just see it up on the big screen some day! Your discovery of this book kind of mirrors my own! I heard about it in the beginning of 2011 and then saw it was optioned for a movie and went crazy in wait for the damn thing to be released, because it sounded freaking AMAZING. And then I read it and IT. BLEW. ME. AWAY. I am SO happy to see you loved it! Also: ROOOOOOOOOOOAAARRR! No comment I ever make about this book is complete without me roaring his name. It's a habit I can no longer shake :) I demand a Roar spin-off! Fab review Lyns. I was a little hesitant to read it but I will definitely pick it up now.